Ernie Banks died last Friday at 83. Known globally as “Mr. Cub,” Banks became the Chicago Cubs’ first African-American player on Sept. 17, 1953. In his 19-year playing career and 40-plus years as an ambassador for baseball and the city of Chicago, Banks was a two-time National League Most Valuable Player, and he was inducted into the Hall of Fame in 1977. 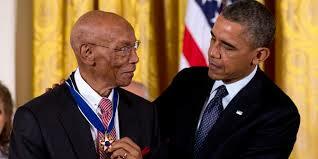 In 2013, in recognition of his goodwill, he was awarded a Presidential Medal of Freedom. At a news conference last Sunday, family attorney Mark Bogen read a short statement and praised Banks for his contributions inside and outside of baseball, including support for the military, gay rights, kids with disabilities and numerous charities.